So a funny thing occurred a few weeks ago. Games came out both for one of my favorite anime of all time and what is unconditionally my least favorite, both from the same publisher. One Piece is a consistently wonder- and adventure-filled story full of excellent world building, irreverent silliness and absurdity, interesting fights, and genuine heart. The other anime is empty wish fulfillment for 14 year old boys and is basically the anime for young teen male equivalent of Twilight. Relevance to this review? None whatsoever. Such is my hatred. Anywhosers! 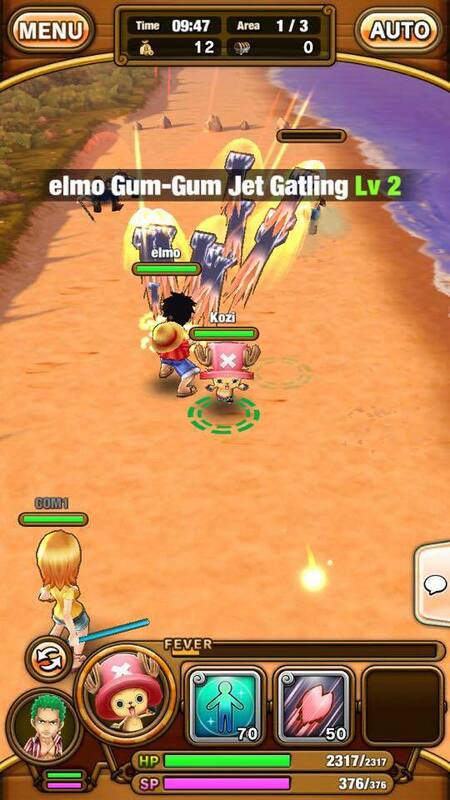 This is One Piece: Thousand Storm (Free), and its freemium elements are mighty, but it’s a pretty good time for fans. This isn’t the first time I’ve talked about freemium fan service games, which are more often than not tied to some anime property. They mostly all follow the same freemium trends and mechanics, and they’re pretty much all Namco Bandai mobile games! Stuff like Digimon Heroes (Free), Tales of Link (Free), Dragon Ball Z: Dokkan Battle (Free), and even One Piece: Treasure Cruise (Free). Thousand Storm is more of the same, but the gameplay segments actually showcase what One Piece is about: Mowing down waves of scrubs with your awesome zany powers to get to the main fights with much tougher main baddies. Instead of some take on a match-3 or card game you’ll direct beloved characters around the field and decide when to use their power attacks. It’s not anything to write home about in terms of depth or complexity, but it’s a nice change of pace. 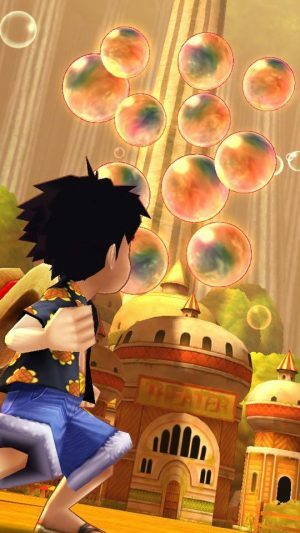 You’ll start out in one of the 4 main seas of the world (North, South, East, and West Blue) and with our main hero and captain of the Straw Hat Pirates, Monkey D Luffy, plus either Zoro, Sanji, Nami, or Usopp, depending on where you start. After the starting tutorial island, you’ll enter the proper story of the anime, but not from the beginning. From the Sabody Archipelago arc, which bookends the 2 year time skip. This is why you’ll see variations on certain characters like Luffy and Zoro with “2 Years Ago” or “New World” attached to their names. The time skip in the anime brought with it new main outfits and new abilities after all that time of training. Sorry for the brief anime nerd-ing. This show has 777 episodes, plus occasional movies and specials, and I have seen almost all of them, save for a few filler arcs and the most recent couple episodes. 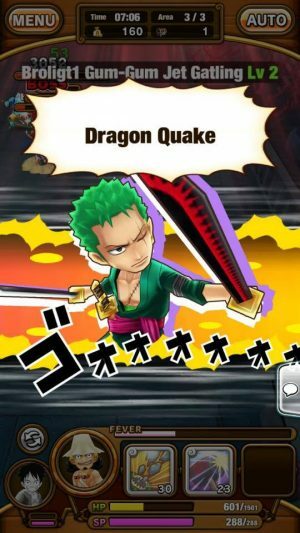 The story of the game currently stops in the previous arc at Dressrosa, just as an FYI for fans who know what the heck I’m talking about. Each mission takes you through 2 or 3 little hallway stages, with the last stage always involving a boss fight. Sometimes it’s a generic tough enemy boss and sometimes it’s a famous enemy from the show. Stamina mechanics rear their ugly heads as usual, along with three forms of currency. The main currency used for general in game stuff are Bellies, the in-world currency of the anime. The second are Rainbow Coins, the premium currency, used for things like stamina refills and second, third, and fourth extra tries at the level you’re currently super under-leveled for. The final currency is friend points, which are a nice freebie. You get them for playing with up to two other people on a mission. You don’t need them for anything, but you can use them to buy extra scene cards. Scene cards are where all your character’s stats and abilities come from. More on that in a bit. Gameplay is serviceable, but the real draw of this game is the nostalgia and fan service. Seeing cute, almost chibi like renditions of the heroes throwing out their famous moves is neat. Like with most of these games, character collection is half of the fun. 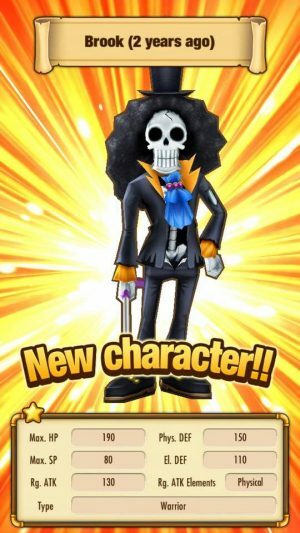 You gain certain character tokens just by playing the story, but special characters can only be earned through timed events. The last event had post-time skip Luffy and Usopp, and the current event gives you access to post-time skip Brook and more Luffy. (You’ll see a lot of New World Luffy) Brook, by the way, is a skeleton and a musician, but also a swordsman. I promise this all makes sense in the context of the world. The story has always had silly nonsensical stuff in it as part of the world building, but it’s always consistent with itself. Like the Transponder Snails. These are snails… with me so far? That are basically cell phones. This has been unexplained for over a decade, and the fan-base has just kind of accepted it. In this game, snails come in movie projector form. When you spend rainbow coins or friend points at the theater, you’ll get a number of new cards. Rainbow coins get you the most powerful stuff, but the friend packs are quite valuable. Scene cards also include food cards for leveling up your regular scene cards (Naturally, the cliché hunk of anime meat is the mightiest, so sayeth Luffy, future king of all pirates), money cards for selling (though you can sell any card), and evolution cards. 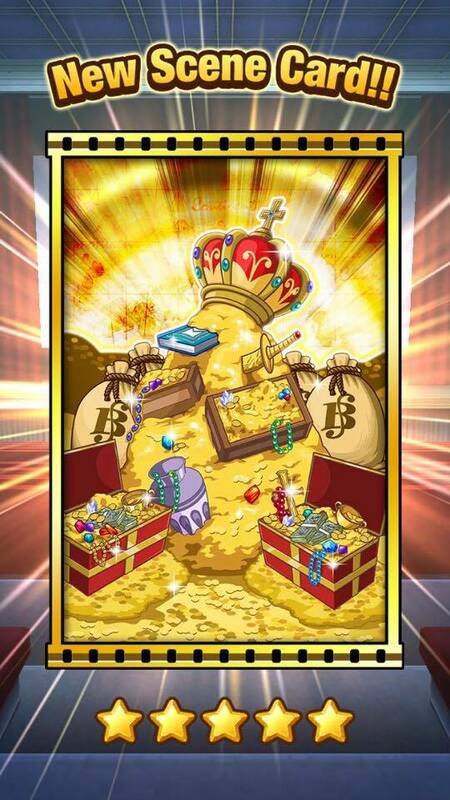 Once a card maxes out its level, you’ll need evolution cards to break through to the next rarity, resetting the card to level 1 but increasing overall stats and raising the max level. You can only have up to 150 cards. Allegedly, anyway. Because I went over 150 and I’m not sure anything happened. The number out of 150 was just red instead of white. I hope they don’t eventually get eaten by the game, because evolution cards are the biggest pain in the game. You can only get evolution cards by completing daily missions, which is easy enough. But there is enough variety that you will get a different kind every day, and you won’t be able to get that kind again until the next week. Expect to spend loads of time sitting on maxed out cards, and either leveling weaker cards instead or just accepting that your time is meaningless because you don’t want to lower your stats. Your power comes not only from high level scene cards, but also a higher-level character. Each level gives you access to more slots to equip cards, and that’s how you get to some of the crazy high numbers you’ll see other people have. Getting a character to 4 stars is easy enough, and takes 25 character tokens, but 5 stars takes 60, and I don’t know what 6 stars requires. The nice thing about this game is the multi-player. 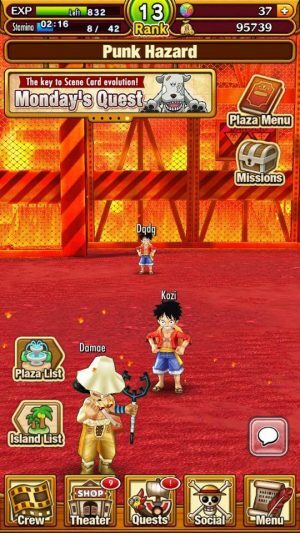 You see, playing a mission solo or hosting a mission costs stamina, but joining and helping someone else’s mission is free. For the first 11 or 12 levels, you could easily coordinate with 2 real life friends to rotate hosts and you’d probably level up consistently enough to just keep that going. I accepted going in that this game was probably going to be super grindy and a total time sink, but man is it ever. 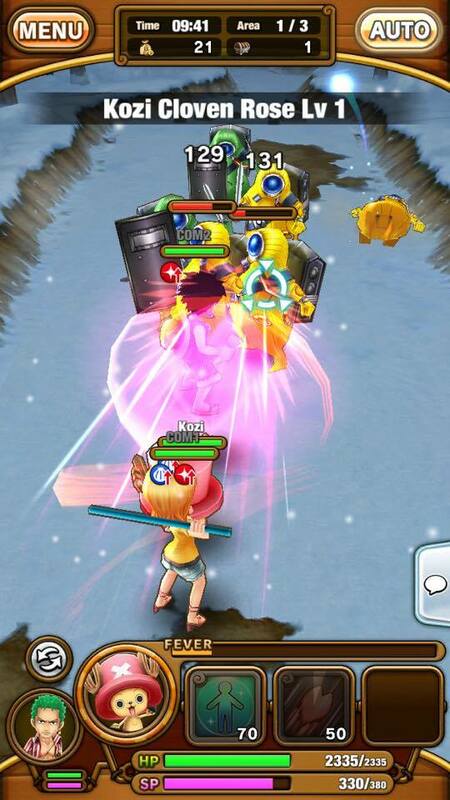 Between replaying missions for evolution cards or character tokens, there’s just so much busy work in navigating menus and feeding lesser cards to your superior ones and so on. And if you’re on an older device, like I am, you’ll deal with super obnoxious loading times. I’m talking like 5-10 seconds, but when you deal with that several times a minute going from menu to menu, it’s a pain. They were nice enough to only reset your daily login rewards every 10 days, so you don’t have to come back every single day. Though you probably should. The graphics and effects are very nice for this kind of game. Especially if you have a newer device. If you’re okay with the grindy nature of these games, Thousand Storm will offer you a fun walk down memory lane. I’d love to see more pre-time skip arcs. 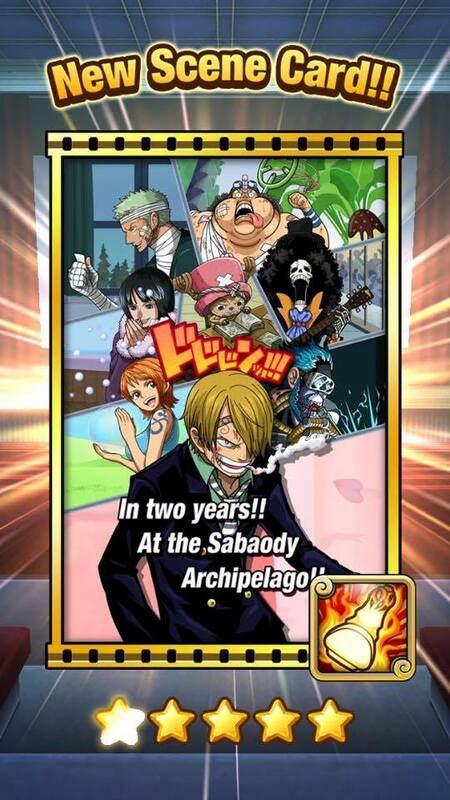 Alabasta and Ennies Lobby would be incredible. I’m SUPER upset that Franky, the cyborg who literally runs on Cola, isn’t in the game yet. He is one of my soul animals. I don’t know how they managed to fit his monstrous post time skip frame into the game, but there it is right in the trailer. Just listen to this awesome jazzy theme. No other theme in the show sounds like this. I loop this song every single time I need to go to the market on a cola run. Anyway, There is an offline single player mode, which is appreciated. Once you get to Punk Hazard in the story, you’ll gain access to pirate alliances for more bonuses. The game itself is just OK, but the One Piece wrapping makes it quite enjoyable. Sword Art Online. The other anime is Sword Art Online. I don’t care. Fight me.